The Flat Stone Tavern & Grill in Egg Harbor Township will be hosting a Beer and Dinner pairing on Wednesday, May 3rd with Tuckahoe Brewing Company. Flat Stone has really been bringing it with their beer selection and has many locals on tap. The event is on Wednesday, May 3rd and starts at 6:30 with a 4 course meal all paired with one of Tuckahoe’s great selections. The price is 50$ per person and includes the tax and gratuity, plus one additonal pint of Tuckahoe Draft. We love these events as they give you a new way to experience beer as the Chef and the Brewers collaborate on the selections to ensure a perfect pairing. For tickets, call, email or stop in to the restaurant. You can find the contact information HERE! 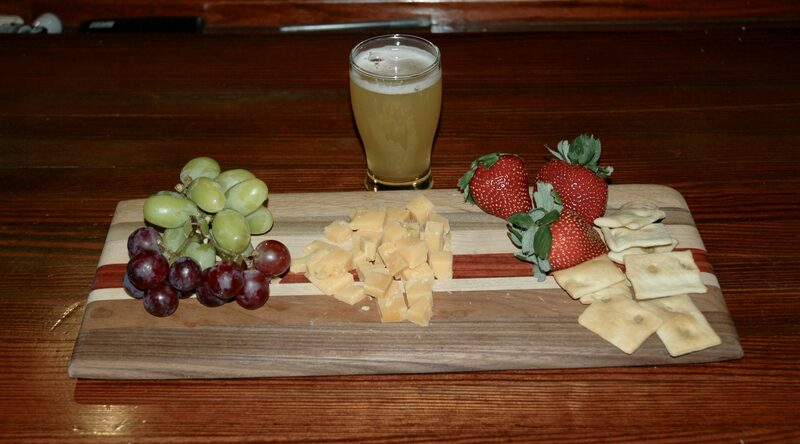 For this pairing, we traveled to Tuckahoe Brewing Company in Egg Harbor Township. We met with Tuckahoe’s Sales Manager, and all around great guy, Rob Callaghan in search of the perfect beers to pair with the food that we had prepared. Tuckahoe Brewing Company is one of the first South Jersey breweries, established in 2011 in Ocean View, Cape May County. Tuckahoe made a move to Egg Harbor Township in 2015 to give them the extra room they needed to expand production and increase the size of the taproom. The taproom is spacious and features many tables and a large wood topped bar. The bar faces a large window which gives you a great view of the brewing area so you can see where all the magic happens. In addition to the taproom, their beers can be found in many bottle shops, bars, and restaurants throughout South Jersey. For the cheese course, I once again decided to go with a high-quality Di Bruno Brothers Cheese, their Beemster Classic. This robust, sweet and salty cheese is firm with a smooth feel. Originated in Holland, Beemster is made from the milk of cows that fed on grasses located on a UNESCO World Heritage Site. Although Di Bruno Brothers suggest a dark stout, I chose to go outside the box and pair it with Tuckahoe’s Quatrain IPA. Quatrain IPA gets its name from the 4 hops used in the brewing process namely Mosaic, El Dorado, Columbus, and Azacca. With its citrus flavor and it’s hazy golden appearance, this juicy beer really complimented the Beemster Classic. It will be interesting to see what Di Bruno Brothers Cheese that Passion Vines Beer Expert Sean will choose to pair with the Beemster Classic at their tasting event with Tuckahoe Brewing on Thursday, April 6th. For tickets and information, you can follow the link HERE. For the appetizer course, I prepared a family favorite. Bacon Wrapped Jalapeno poppers stuffed with a garlic and herb cream cheese. This Spicy app had me considering a few different choices. We first tried the pepper with Dennis Creek Pale Ale. The use of Centennial and Cascade hops gives this beer a nice floral aroma with good bitterness on the back end. Rob then suggested we try the Reed’s Bay American IPA as well, and instantly I knew that this was the correct choice. This 6.2% ABV IPA was brewed with Chinook, Cascade, and Centennial Hops, this beer had the perfect amount of citrus and a good bitter bite that perfectly complimented the poppers. For the entree, I made my Applewood rubbed baby back pork ribs with a little brown sugar. Ribs are clearly a fan favorite with beer drinkers and I knew that there was only one beer to pair it with, Tuckahoe’s Anglesea Irish Red Ale. 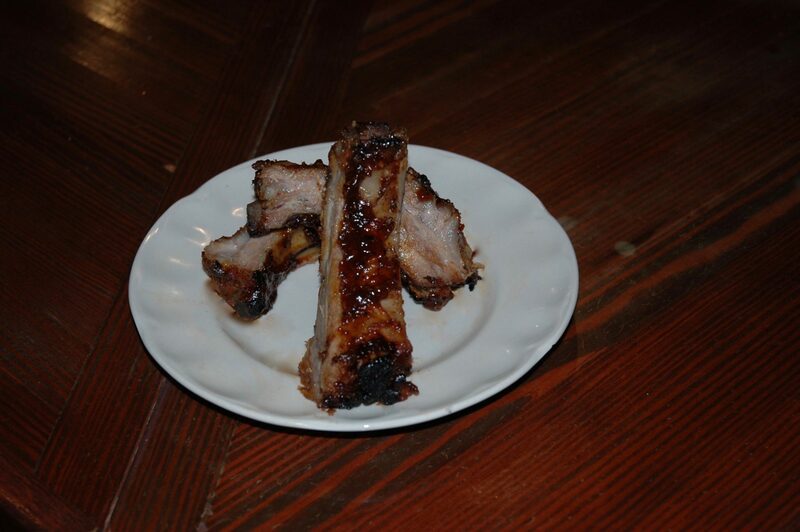 The ale’s roasted barley, toffee, and caramel undertones really brought out the sweetness of the ribs. At 5.3% ABV, this highly drinkable red ale really complimented the ribs perfectly. As a side note, this is my personal favorite of all of the flagship beers that Tuckahoe produces. I don’t think I’ve ever had a better pairing in taste and name than this one. 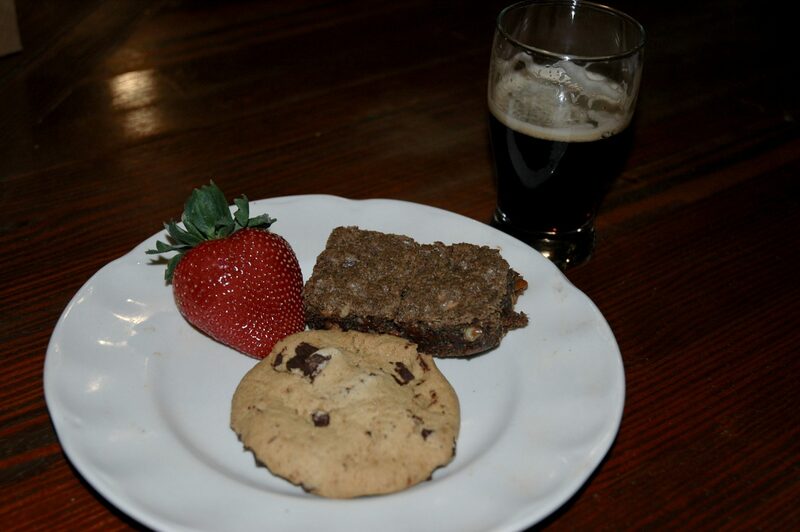 I knew there could only be one dessert that I would pair with Tuckahoe’s Kid’s Table Milk Stout, and it would be a nice, big chocolate chunk cookie. This decadent stout, brewed with roasted barley, chocolate, caramel, and milk sugar really made for a great pairing. What really put it over the edge is when Rob dunked his cookie in the stout, the rest of us quickly followed suit and it worked really well. Coming in at 6.2% ABV, this stout made for a perfect finish. Bonus? Yes! Rob surprised all of us with a Blondie that he made from scratch using spent grain from Tuckahoe’s Steelmantown Porter. Spent grain is starting to gain traction in baking, and Rob was really excited about the prospects of using spent grains in the future. We each had one (well maybe more than one) accompanied by the Steelmantown Porter and they were fantastic! The spent grain gives the Blondie a unique flavor and texture profile that separates it from a traditional flour product. People are starting to use the spent grains to make pasta, bread, pretzels, dog treats, and most anything that calls for flour. This brought a really nice finish to a fun, and flavorful, pairing session. I would like to thank everyone at Tuckahoe Brewing Company for the tasting and the hospitality. Keep doing what you are doing and, as always, Enjoy Your Pour! In this debut article for South Jersey Beer Scene, I would like to talk about two things that I love: Food and beer. Pairing beer with food is a great way to experience the exploding local craft beer varieties out there. It can also be a great way for couples to get together and enjoy these flavors and have fun. My goal is to help you find the right beer for the right food. Today I will be highlighting flagship beers from Slack Tide Brewing Company located in Clermont, NJ. When thinking about pairing beer and food, quality does count. Here in South Jersey we are lucky enough to be able to find Philadelphia’s own Di Bruno Brothers’ meats and cheeses here in South Jersey at many bottle shops and specialty stores, and their products are some of the best in the area. Nothing would go better with their Manchego cheese then Slack Tide’s Bell Buoy (Belgian blonde). This Spanish sheep’s milk cheese paired with Bell Buoy’s sweet dry finish really compliments the buttery, flavorful cheese. Now for the main course. My pick would be Slack Tide’s 5 Fathom Pale Ale to be paired with a nice beef filet or rib-eye steak. I would also encourage you to melt a little bleu cheese on top which will send this over the top. 5 Fathom is a great beer on its own, but combining it with a nice juicy piece of beef really adds to the enjoyment of the beer (and the steak!) Steak and Beer is clearly a home run in any beer drinker’s repertoire, taking the time to enjoy it with a great beer makes it that much better. And now for everyone’s favorite, dessert! With its roasted coffee flavor, Slack Tide’s Monkey Face (dry stout) would be a great companion with some Chocolate Covered Strawberries. The sweetness of the fruit and chocolate are fantastic with the beer! Who needs coffee with dessert when you can have a beer! Slack Tide Brewing Company offers many great seasonal brews that would go great with different foods which I will certainly explore in a future post. With the craft beer scene exploding in South Jersey, I will be suggesting more beer and food pairings from different breweries. Also, with so many eating establishments putting local brews on tap, I will be recommending items on their menu, too.